We opened our doors in May of 2017 with the mission to provide a seamless choice for an eye doctor in El Paso. Our team specializes in eye and vision care. We will fully evaluate your vision and the health of your eyes to determine if you are prone to diseases or require further treatment. This procedure is performed when your pupils are not dilated. We fit, prescribe, measure, and match the best options for contact lenses. tear-film test to check for dry eyes. First, we measure the pressure inside your eyes, often referred to as the “puffof-air” exam. Through our diagnostics, we will be able to determine if you are at risk or have glaucoma. One key reason to consider a glaucoma diagnostic is that thereare typically zero symptoms of glaucoma until a patient has experienced severe loss of vision. We can then refer you to a specialist. If prescription lenses cannot clear your vision, you may require a cataract operation. A cataract is a clouding of the lense inside the eye. With age, loss of vision is extremely common. Individuals over the age of 40 should be tested for cataracts. Should you require surgery, we will refer you to a specialist. The health of your eyes deserves serious care and attention. 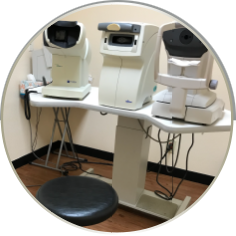 Our eye doctor will test for other diseases to offer you peace of mind. We will always advise the best option to treat your respective condition. We are a team of fully dedicated eye doctors who take pride in the happiness of our patients. By ensuring that each patient leaves fully satisfied with their service, our success is measured in our customer’s satisfaction with their visitation. If you are not happy with your service, we want to know about it!